It's going to be heart to write this without pulling out a single "Jesus" joke. 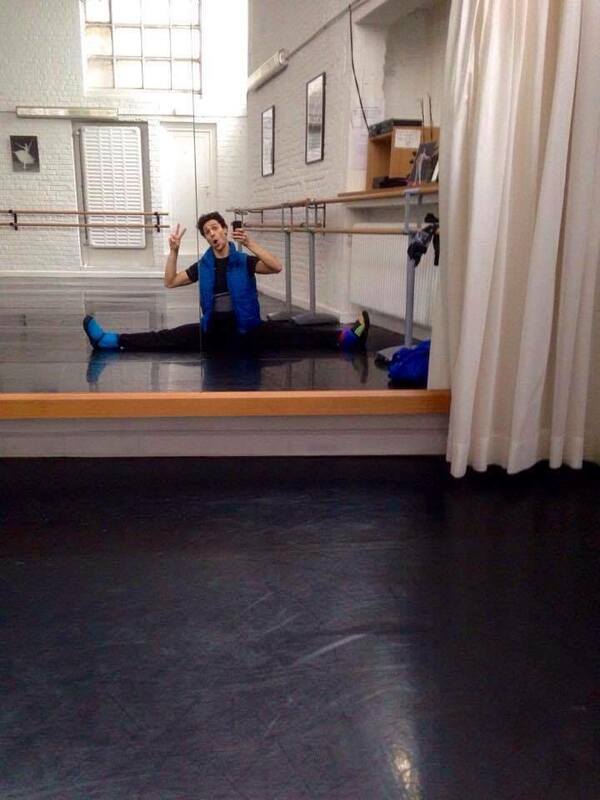 I met Jesús last summer when he joined the company. Before he even arrived, we all couldn't help but resist cracking up over the greatest puns and jokes over his name. The good thing was, when he arrived, they didn't have to stop. They still haven't. Jesús is the kind of person who greets everyone with a hug and a kiss and huge grin on his face. He's the kind of person that seems to be filled with an unsurmountable amount of joy. He's also the kind of person who can laugh at himself just as easily as he can make other people laugh. He's also somebody christened in my life as the happiest person I've ever met. And to me, he's been a very good friend and dancing partner the many times we've gotten to pas de deux together. But there's more to Jesús than his jubilant demeanour. There's quite an interesting story that I've always found quite inspiring, and specifically for this month's focus on practice, relevant. Coming originally from Gran Canaria, Jesús has quite an unconventional story has to how he became a ballet dancer. Quite uniquely, he only started ballet at the age of 21, and myself being one of those common people who have been dancing from the age of 5, this already to me sounds unfathomable, yet impressive. This lead me to ask him more about his whole story and how he discovered dance. "Since I was a child, I loved to dance. I remember dancing with my sister all the time. But my mother didn't really want to see it. My mother had this idea, and it was also a thing in the culture, to go to University and get a degree and then have a government job. My mother wanted this for me, this security, and wasn't super open to the idea of working in the arts." Despite this conflict, Jesús never speaks poorly of his mother. They have a very good relationship. He also explains that she liked the arts herself, having once played Canarian folk music in a band, but that the influence of society had her commit to studying instead. "When I was 15, my neighbour asked me if I wanted to join her in a salsa lesson, so I went, and i really enjoyed it," Jesús tells me with fondness, "I continued with salsa until it became routine. I went to salsa congresses and did workshops. Then I went to Madrid and did an audition for somebody who was looking for a partner." With this audition, Jesús got the job, but it eventually fell through. He was then meant to be a cover for the role, and eventually turned into nothing at all, all happening after he had already moved to Madrid for this opportunity. He stayed around, continued dancing and worked in a disco while being in Madrid, but the way it all worked out didn't quite live up to his expectations of being in Madrid. So he made the choice to return to Gran Canaria, where he started studying to get a degree and to make his mother proud. But with an undeniable dancing itch in his body, Jesús continued salsa dancing while completing his degree in English Literature. It was around this time that he also started taking ballet classes, as an effort to improve his salsa dancing. This was where he met his first ballet teacher, Ira, with whom he had a very special bond. She was the first person to support him as a dancer and encourage him in this ambition. "She told me, 'Jesús, I must tell you something - you are so bad, you don't know anything. Until you start working as hard and as long as a professional dancer, we won't see how far you'll really get.'" We both laugh at this very critical statement, likely because we're both aware of the point he's at now. "My first ballet class was horrible. But I really liked it," we laugh again, as we both know very well what a ballet class can be like when it's hard, "I saw it as a challenge. Already the next day, I wanted a better fifth position, straighter knees, a higher arabesque. I liked that. Everyday. I also liked the music. And I was also the only boy. "My director noticed that I was working hard and staying later. The secretary who closed up the dance school at night would yell at me 'Jesús! You need to get out!' And I begged her to let me stretch for another five minutes." Just like that, Jesús felt the addiction. The hard work, the physical progress, its technicality - it's all what pulls you into ballet. 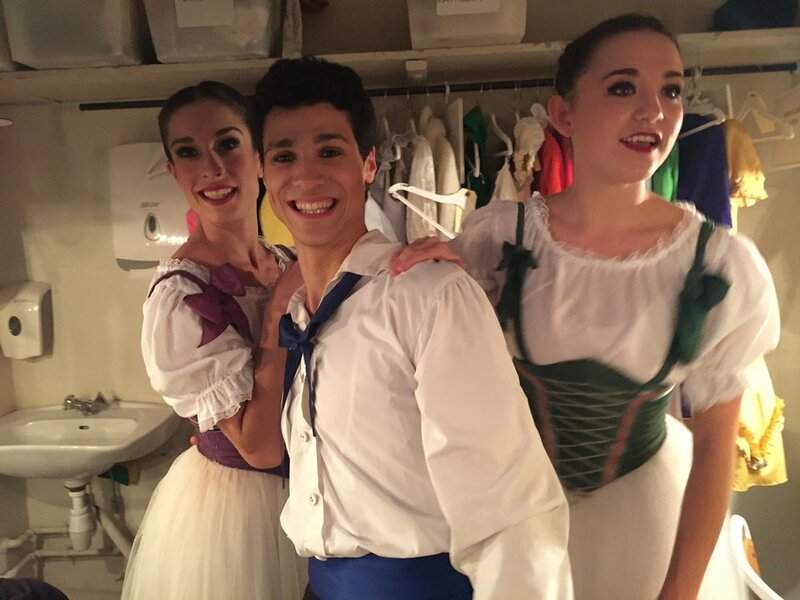 "I used to even miss my classes at the University to go to ballet," he says mischievously, "Thankfully, I had really good colleagues who would let me borrow the notes that I would miss." At some point during his studies, it became clear dancing was Jesús' priority. He eventually finished his degree and felt the relief and happiness to be able to finally focus on where his passion was. He gave his certificate to his mom telling her that he did it for her. I ask Jesús if this helped his mom's acceptance in his choice of pursuing dance instead of a government job and he tells me he thinks so. His mom is happy because Jesús is happy in his life, and perhaps from her perspective, now he has that degree to provide him with that societal idea of security. "I worked in my ballet school's youth company which was a little bit more contemporary. Then I went to a summer course in Victor Ullate Ballet where I worked with Menia Martinez, who then asked me to come train with her in her school in Brussels. I wasn't one of the best at the summer course but she must have seen some potential. I went and I learned so much with her. "I wanted to just take my time to focus and train but Menia told me 'Jesús, wake up because you are old!'" We laugh again, though we know the truth in this. Ballet dancers age twice as fast. It's a career that's so short that at the ripe ages in your twenties, you're already kind of old news. "After 5 months of training with her, I got my contract here at Tivoli," and that's where I met Jesús. "I didn't have the expectation to be a professional. I just let myself do my best, but it was clear that I needed to have dance in my life," he thinks for a moment, "If it wasn't for Ira, I probably would have stayed in Gran Canaria and would be teaching English and would be depressed. "During high school, I was lost because I was brought up thinking dance couldn't be a profession, so that was frustrating because I didn't know what I would do," Jesús reflects, "I don't regret anything that I did, especially now that I've achieved my goal. For the moment, I can't see myself doing anything else. And maybe it's because I started so late. But for now, I still have the passion." "I want to be a better Jesus. I want to keep on training. The practice of ballet involves a gymnastics and that's a clear way to improve," he tells me, "I'm ambitious in a good way. I want to do what I like to do and achieve what I deserve, according to my work." "I must say that I was lucky," Jesús concludes, "I was surrounded by people who really supported me. People who really helped me in all aspects. I'm pleased. And very, very lucky."